There is no better spot than Delhi to quell the insatiable needs of adventure seekers. With a plethora of activities to engage in, Delhi and the areas in its vicinity attract thrillseekers from all over. Adventure activities such as white water rafting, zorbing, rock climbing, night treks and bungee jumping are just some adventures that await you. Here are our top picks for awesome adventure activities near Delhi. Flying Fox is an activity that requires immense courage and an appetite for risk-taking. A zip line is mounted between two points and you travel from one end to the other at varying heights. The visitors who are airborne over Neemrana can witness the beauty of the forts and the royal residences of Rajasthan. The Flying Fox in Neemrana also offers a nighttime zipline activity that multiplies the thrill level. The Jim Corbett National Park is one of the most famous national parks in India. The reserve has one the highest numbers of animals in the country. The game drive safaris allow you to witness the animals in their natural habitat. You may get to spot various exotic animals such as the elusive white tiger. An amazing adventure trip near Delhi. The Gucchu Paani, also known as the Robber’s Cave, is a cave-like natural formation that runs through the river. The central part of the cave has a fort-like structure that has been eroded by flowing water. The caves are well known for is known for the number of unusual cold springs there. There is a massive network caves that are quite a sight to behold. Named by the Britishers, it is believed that robbers would take refuge in these caves after a heist . Rishikesh has India’s first fixed-platform bungee jump. The facility is located in the dense pristine forest of the Shivalik mountain range. The jump is India’s highest, standing at 82 metres. Traveling to the jump destination will give you a beautiful view of the mountains, where you can witness the untamed beauty of nature. The facility also gives you a recording of the jump so that you can relive your experience and show others. Along with the bungee jump facility Rishikesh is also famous for its rafting expeditions. You can raft your way through the gushing rapids of the Ganga up to the city of Hrishikesh. You can also choose to jump into the freezing waters and take your rafting experience to an all-new level. 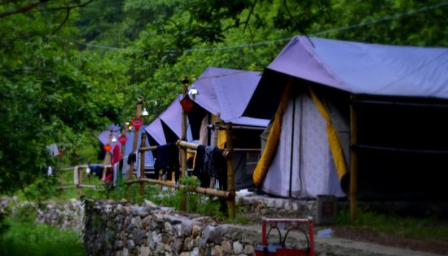 There is a camping option available by the Ganga River that makes you feel one with nature. The Elephant Safari is one of the key highlights at the Amber Fort in Jaipur. You can get to tour the entire fort on the back of the massive yet humble animal. Besides riding on the elephants, you can also indulge in activities such as feeding and coloring the elephants after you’are done with your tour. Mussoorie is known for the scenic beauty that surrounds it, being one of the most well-known hill stations in India. Gun Hill is the second highest point in Mussoorie and is connected through series of cable cars. The ropeway ride is a new fun way to travel to the top of the hill and is certainly not for the faint-hearted. The ropeway ride takes you directly through the valley and it can be quite the experience at those massive heights. If you’re looking for adventure sports near Delhi, then this is a great bet. You can try out rock climbing at Kamaoni. However, make sure that you’re in peak physical condition as it can be a dangerous activity. Lansdowne is known for its beauty and the greenery that it is blessed with. The place is named after the British Viceroy Lord Lansdowne, who was awed by the beauty of the place. Camping is the perfect way to spend your time in Lansdowne in the lap of nature. You can take part in activities such as dancing by the bonfire and cooking a dinner with the locals in the open at night. Auli is one of the most well-known ski resorts in India. The place is covered with massive amounts of snow that allows skiing to take place. The place comes equipped with a ski school and internationally-certified instructors to take care of all the needs of the patrons. Besides skiing, people can engage in activities such as snowball fights, with the help of snow cannons to take the play to the next level. The Kheerganga Trek is a three-day trek deep in the heart of the Himalayas. Kheerganga is situated in the Parvati Valley, with a dense forest and hot water springs to enjoy. You can also view the beautiful Spiti Glacier. The trek covers the Shiv Temple, the Rudra Naag Waterfall and other interesting rock formations. Bir-Billing is one of the best places in the world for paragliding. With perfect conditions, it has even hosted the Paragliding World Championship a few times. Despite this, it isn’t tooo expensive either. Paragliding is a must-try the next time you’re in Manali and the Kulu Valley. There are trained pilots who guide you through the whole process. The paragliding activity allows you to witness panoramic views of the valleys. There are two take-off points: in the Solang Valley and in the Hallan Valley. What better way to go down a hill than in a giant transparent ball? That’s exactly what zorbing is all about. One of the most fun adventure activities near Delhi, it will leave you breathless, not only because of the strain on your body but because of the magnificence of the scenery. The areas around Delhi provide so many adventure opportunities to enthusiasts. So plan an adventure trip near Delhi the next time you have some time off. Do tell us about your experiences in the comments section below. Stay Amidst Nature By Visiting These Trekking Places Near Delhi! Delhi is not only the capital of India, it’s a centre for culture, art and history in India.